At a little rearranging, and creating a "vignette." I typically place things all around, but this sideboard thing gives me problems. I guess I don't have many areas to set things out, so having surface area confuses me. I wanted to display my mini collection of pill boxes as well as my new hankie. I don't know if I'll keep it like this--I don't know how I feel about the hankie on table thing anyway. You'll see my "bar" to the left! I put away certain items I had sitting out, and display others. 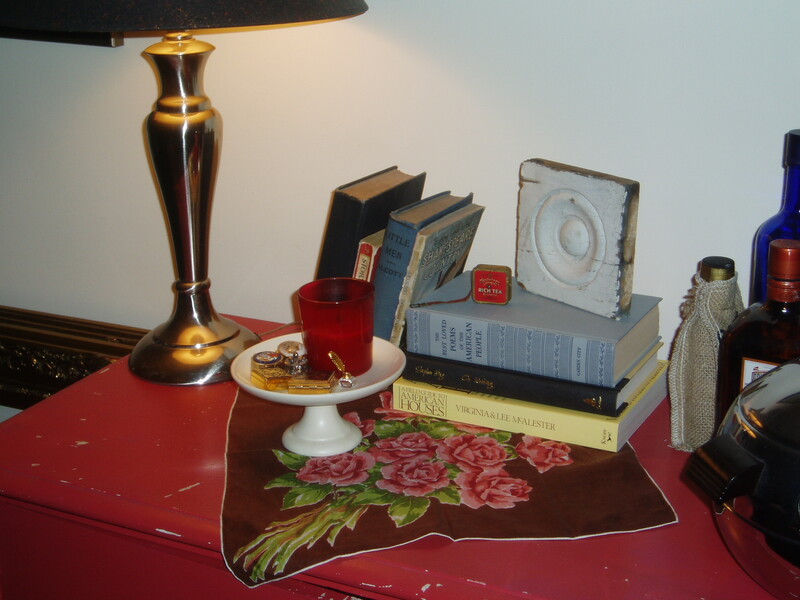 Readers, do you do this--or do you constantly display every objet? I used to display everything I had, but found I like to see different stuff and that it's fun to put it away and bring it out again. I also don't know what to do with this cabinet. As you can see, it has a bit of the "shabby chic" to it, and not intentionally. It is a solid wood, Queen Anne style cabinet that I bought around 10 years ago at an estate sale before moving into my first apartment. I was not well versed in how to finish furniture, and didn't sand or prime. It used to be white with different knobs. 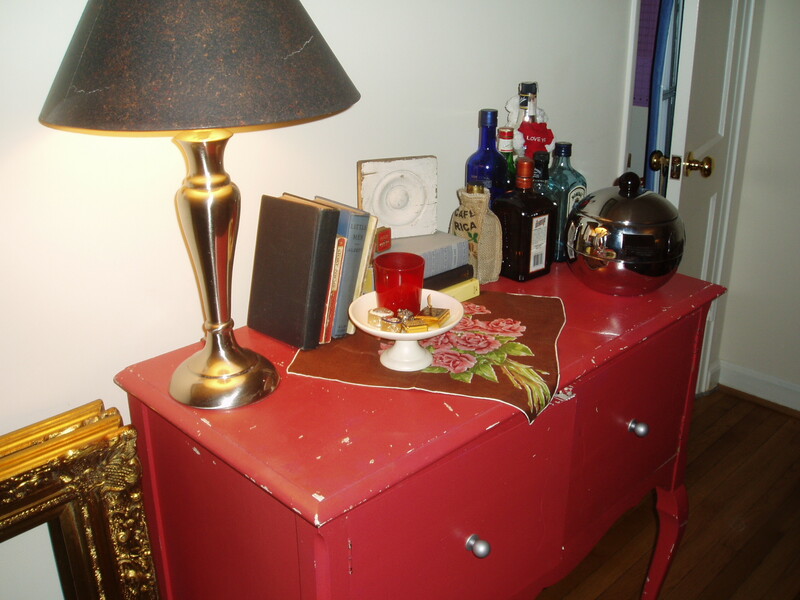 I painted with latex from Martha Stewart's Sears paint collection "Bee Balm Red" and replaced the knobs with Ikea silver knobs. It has served a few functions throughout its life. I don't know the original purpose, though I venture it was a sideboard. I used it as a sofa table in my first apartment. When I was at the group house, it was a sideboard again and I stored kitchen/entertainment stuff in it (if I recall correctly). At my last apartment, it started as a TV stand and then sideboard. Now, it stores craft supplies. I'm thinking of repainting and replacing the knobs again. Thoughts? Ideas? I don't know what the little wooden thing is called on top of the books, but I found some in the garage this weekend, and I'm so excited about them. Thanks for the inspiration! I don't know what they're called either. I bought this at a salvage sale to support a historic society, but I've also seen them in home depot! Does your space reflect your political leaning?